Saturday was a most excellent day to be on a bicycle. That’s hardly the point, but it’s just true: when there are multiple protests and rallies going on around the city, plus the rest of things to do on a weekend, a bike is the best way to move quickly and easily, especially as cops and cars start blocking entrances and exits. I thought about this, about how car culture makes protest culture that much harder because we become so easily immobilized, as I inhaled a stack of blueberry pancakes at the diner on the corner before biking over to Sandtown-Winchester for the first gathering of the day to remember Freddie Gray, killed by Baltimore City cops almost two weeks prior. I had a vague idea of exactly where folks would be gathering, but I decided to use the tactic that’s worked best for me since my first ACT-UP rally in NYC in 1994: get to the general area and then follow the police barricades. This usually works because protests are like set plays–people organize, the police organize their response–because protesters have outlined the plan for them in asking for a permit, police are following the same twitter as the rest of us, or because they’re at the table with the protesters, either out as cops or undercover. And then the media come out, too. Nothing works if they aren’t all there, and they surely were on Saturday. The cops kept a low profile at the start, though, so I took the long route, winding through and around Sandtown-Winchester, following the sound of the helicopter overhead until spotting the folks carrying signs and decided to follow them. The crowd was small at first, but it grew as we all walked around the neighborhood, “All night/all day/we will fight for Freddie Gray.” I walked with B. and we swapped stories about other marches we’d been on, what it’s like to teach about this stuff when it’s happening right here but not necessarily to our students, and shared hellos with other friends we ran into along the way. These things are also about building that community, and that’s what it felt like–a whole bunch of people concerned about the same things taking a second to remind each other that we’re all still here, and no, the cops can’t just break a man’s spine and expect us to act as if this is just a collateral damage, even if that’s what it ends up being in the eyes of the law so many times. The pace of the march was so different from the pace of things according to the news reports I saw later that night. For the news, the day was just a few short bursts–the smashing of the car window, the running of the riot gear-clad cops, the child at the gates imploring the police to make a different life for her. I thought about that as I snapped this picture at the gates of the Western District police department, ground zero for the policing that got Freddie Gray killed. 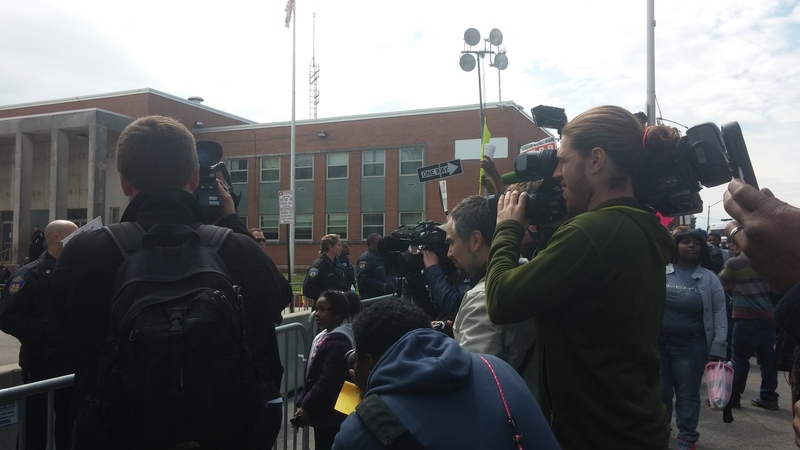 I watched all the cameras bunch up, everyone trying to get the picture that would capture the particular poignancy of the sweet girl face to face with the cops that might cut her life short. It’s the moment, and it crops out all the other moments, the larger picture of the day, the histories that have made this neighborhood, these police, the lack of imagination for other ways to think about what safety means–all of it is cropped out in this and so many other pictures I saw after I got home from a long day in west Baltimore, downtown, at Camden Yards, and on the slow, tired slog up Fallsway, eerily alone after cops blocked off all the freeway on ramps, drove everybody out of the streets, and gave me the sense that I was all alone. I didn’t have that feeling when I was marching or gathering at City Hall, but by the end of it all, the set piece was over, the conversation had turned to whether it was a riot or not, whether it was outside instigators or not, whether that counts as violence or not, and the ability to have a wide range of thoughts about what happened that day, what happens every day, felt snatched away by the tropes that have sunk into the stories we tell about these sorts of uprisings. But before all of that, I snapped this picture, I kept on walking, and I peeled off for a break, taking my bike on North Avenue, empty of cars due to the combined efforts of protest and police. I had North Avenue all to myself for over a mile. What a trip. This entry was posted in police, politics and tagged Baltimore, Camden Yards, Downtown Baltimore, Fallsway, Freddie Gray, police, protests, Sandtown-Winchester, West Baltimore. Bookmark the permalink.